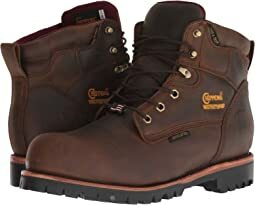 Since 1901, Chippewa has been creating footwear based on simple, fundamental rules. Most importantly, they use only the best materials, the best construction techniques and the most innovative technology. The result -- unquestionably the best boots around. That's what we mean when we say Chippewa Integrity. Rugged as the land they walk, Chippewa. Live the Spirit. Size description seems accurate. Fit my narrow heel/wide forefoot well. 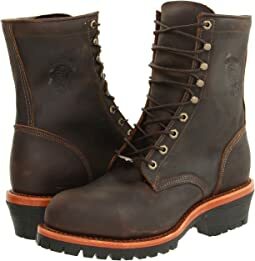 Well constructed work boots - and I’ve worn a lot of work boots over the years. Great support. Seem to be breaking in easily despite the stout leather they are made of. 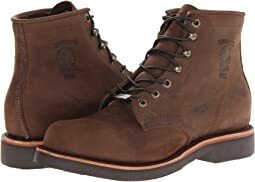 I've worn them all, Wolverine,Red Wing,Duluth Trading..these were perfect from the start. 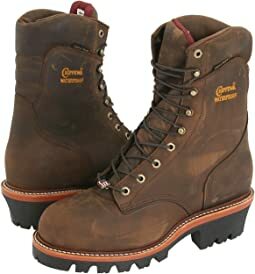 Only had them 2 weeks so longevity is a ?, but I have Chippewa engineer boots that have held up well. I'm buying another pair immediately before they are discontinued. No better review than that. Couldn't be happier, reasonability priced, a fantastic style, and quite comfortable. My only recommendation for anyone that's interested is to try at least a half size smaller than you normally would, maybe even a full size smaller. They do seem to run a bit large. Looks rough and mean. Size is good. Little Toebed rubbing when breaking in. Nothing serious. Only part I didn’t like and took a star off it says might contain cancer causing materials. Probably lead and if u like these shoes you’re probably already touching lead lol. When reviews say they were great right out of the box, and I think that's BS, because it never happened to me. Until now. 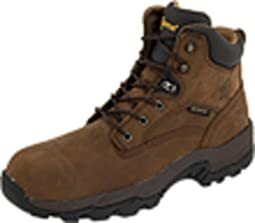 Great boots, fit perfectly (12EE) and they look great. Wore them 8 hours on the first day. Can also wear them with shorts in summer. Buy them. Boots run about a half size large. I typically wear size 9 and 8.5 worked well. Out of the box they felt good and I could tell that with some leather softener, the break in period would be minimal. Arch support was decent compared to my 10 year old Dr Marten's. All that being said, I am returning the Crazy Horse color as it is not the brown shown on this web site. The left shoe is tan renegade, the right shoe is crazy horse. Material feels great and I will be purchasing another pair when these wear out!!! I have to echo other feedback about lacking quality control . The boots I received had a cut in the upper part of the sole (see pic) and the leather stain was so thin in areas that they appeared gray. Wow! 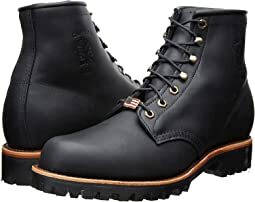 What a quality boot. It fit perfectly right out of the box. They are a little bit heavy but you get used to it very quickly. The boot is built solidly like a tank. It's worth the investment to keep your feet safe while you are doing your business. Congratulations to Chippewa and Zappos. 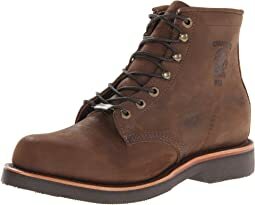 Quality made boots. 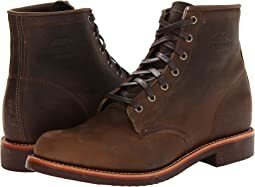 I had a similar pair (Chippewa) and wore daily for three years.. my feet love these boots. Wear them all day. Zero hesitation on this purchase. 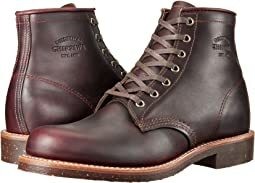 Great pair of Chippewas! 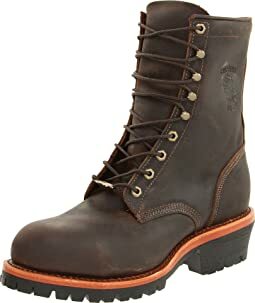 I own a few pairs of the Service Boots, but wanted something that I could wear specifically in the snow and winter weather. These fit the bill. 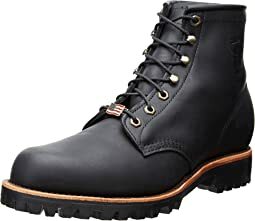 More of a work boot than the Service Boots as expected, but still sharp. These boots are very comfortable from day 1. I’m usually on my feet 10 to 12 hours daily and by the end of day my feet don’t ache. These are lightweight yet offer the safety protection I need. I’m a fan thus far and most likely will stick with this brand next time around. Great boots, old-school quality. They take forever to break in and run about a full size larger than normal shoes. I normally wear an 8.5, with these I had to buy a 7.5. 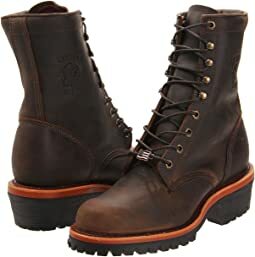 These are my second pair of Chippeaw boots. 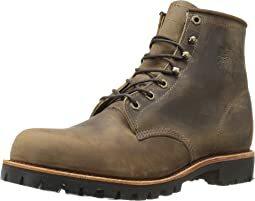 These are very well made boots, nice quality leather and stitching. I love the first pair I have for over two years now and I know I will love this pair the same! I took all the advice of the other reviews on here, and ordered a half size smaller and they fit perfect! I always wear a 10 1/2. I ordered a 10 and they are a perfect fit! 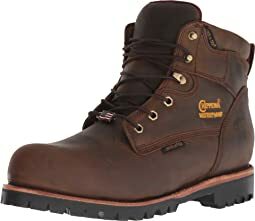 I definitely recommend these boots and feel confident they will last years to come! 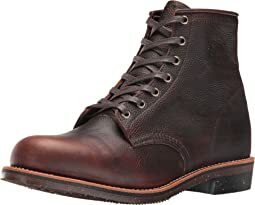 I looked far and wide for a pair of REAL LEATHER Work SHOES for under $200 that were not "waterproof'. Seems nearly all the shoes in this class are now-a-days lined with some synthetic material designed to make them waterproof but in reality trap sweat and water inside causing the lining to breakdown before the shoe wears out. Kind of like wearing a shoe with a plastic bag as a liner. At least that's what it feels like to me. Hard to beat a shoe made with a decent grade of leather like these and no weird lining inside. There is however what appears to be a calf skin lining in the heel and toe areas right where its needed. These shoes seem altogether a decent value for the money. I have only worn them for two days but after standing and working in them all day I hardly even thought of my feet all day. That's a good thing. I would have preferred a more shiny brown leather than the "chocolate" colored leather which has a rather dull finish to it but after applying some leather conditioner they look good. I did notice some slight chafing up around the ankle collar but it went away after wearing them a few hours and adjusting the lacing. 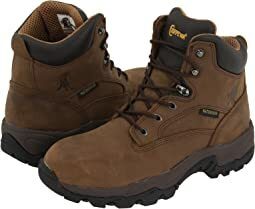 Still need some breaking in before I head out on any long treks but I'd feel confident that these will hold up and provide the traction, support and comfort needed for walking in rough terrain. The vibram soles are perfect for my use and the moderately sharp heel allows one to dig into the ground just enough to ensure resistance to slipping when walking down hill on snow or muddy ground. 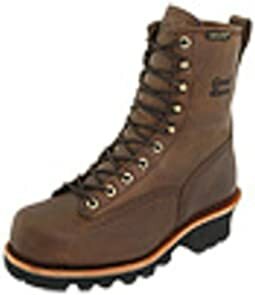 Chippewa loggers feel great. They are rugged and last me for years. Fit does appear to run a little large compared to most shoes and I followed the advice of a lot of reviews and ordered a half size smaller and they fit well. Will take a little time to break in but so far so good. I got the cordovan and be aware that it’s pretty red right out of the box, not as deep a color as say a penny loafer but I believe as it develops some character and wear it will look fantastic. Still that’s why I took off one star on style. Fit and finish were very good, no noticeable issues or any kind. Can’t wait to get them fully broken in. 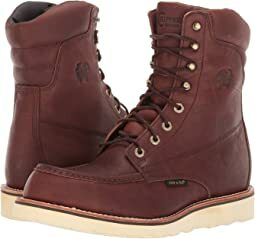 I am a size 9 and occasionally a 9.5, but am wearing an 8.5 in these boots with an insole and a moderately thick (think casual athletic) sock. 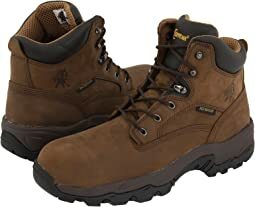 Break in period is a few days--still going through it, but the boots are more comfortable by the day. Overall: loving them and think I'll have them for a long long while. Right out of the box these boots felt great - I expect them to become even better once fully broken in! Good fit, perfect toe room and noticeable arch support. 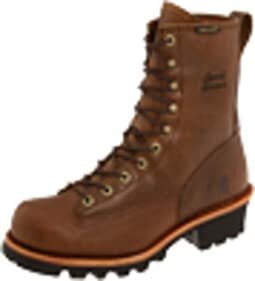 I needed a basic, uninsulated boot and these totally meet my needs - unfortunately, it appears this specific model is no longer being made - or was replaced by the Cibola lace boot (as determined from the Chippewa boots website). I will look to this manufacturer for future footwear needs! After reading the reviews I ordered 1/2 size smaller and they fit perfect. Had major surgery on both ankles and need a lot of support. 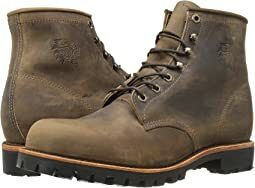 I’ve owned a lot of different boots but these are without a doubt the best boots I’ve ever purchased. 5 STARS. Really like these boots and they fit perfectly. Was hoping the Service boots would fit properly and was not disappointed. They fit perfectly. The Chippewa workmanship is excellent too. I first tried a 1/2 size smaller than I normally wear and the boots were still way too big. I went to a full size smaller and these fit much better. 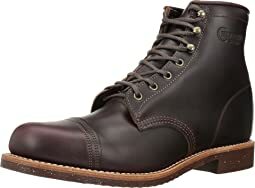 I also first tried a wide boot as some of the other reviews had said they did and that was also large. Settled on a full size smaller and normal width, fit is right on. Can't say enough about customer service. They really worked with me to resolve the issues.